Making it to the cover of Classic Car magazine, the superior quality of Auto Restorations’ work speaks for itself. Established in 1973 Auto Restorations has a story to tell. Every year it must mobilise new car restoration projects. To do this it relies on existing clientele, affluent, discerning people who might already know of the company by word of mouth, prestigious Concours D‘Elegance ‘First In Class’ wins, the publicity that generates in classic car enthusiasts’ media, their advertising, website and brochure—sales brochures, basically—designed to showcase the superior quality of the work they do. Showcase the process of restoration, the completed works, among them some of the most refined and rare cars in the world, and do it justice with advertising and promotional material that has the maximum effect and gives the impression to their select international clientele of an organization worthy of trusting one’s precious, valuable car to. Well crafted and well made custom built motor cars, widely regarded as some of the most rare and beautiful, are the results of the restoration process, a process which varies. Some rebuilds are particularly challenging and may take many hundreds of hours of meticulous work by expert technicians that sometimes stretch over years. The strict rule for their sales material is a focus on the process of restoration and the advantages Auto Restorations offers their niche customer base, working faithfully to an exacting standard at a fair market price. 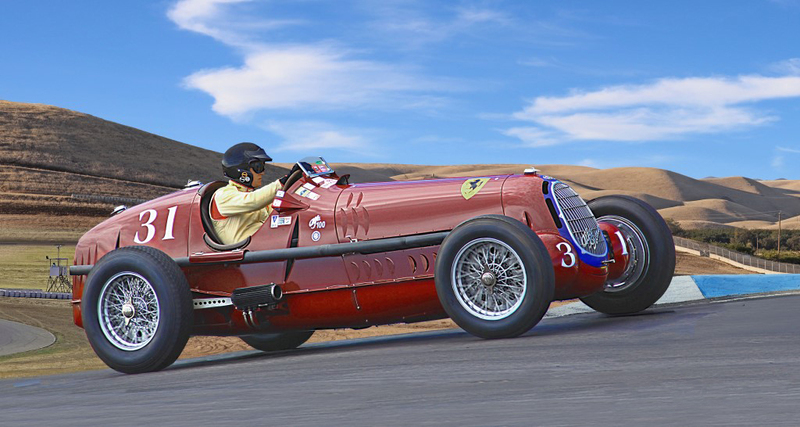 Alfa Romeo Tipo 8C, #31, restored by Auto Restorations in 1998, cresting the hill at Thunderhill Raceway Park, California, 2018. “I chose Auto Restorations to restore my rare Alfa Romeo Tipo C race car, one of only three remaining, because of the Kiwi attitude that if you can’t buy it, you’ll make it”. When shooting informal portraiture avoid distraction from the most important purpose—getting photographs. These photos were shot and photo composites produced 2009–2012, they offer a historical profile of Auto Restorations during that time soon after Allan Wylie stepped up from the Mechanical Shop floor to the role of General Manager. Pictures of their employees on their redesigned website, and capabilities brochure in print helped Auto Restorations transform from a faceless company to people that their customers can relate to. The highly specialised, high value personal service that Auto Restorations’ workforce offer to customers is an advantage that they have over large companies, their multiple international Concours D’Elegance awards attest to this. Good photos of their skilled workforce reinforce this. Italy, the United States, France, and Australia are represented in this lineup of 20th century classic cars, from the current work in progress at Auto Restorations in September, 2009. Whether shooting outdoors or indoors, consider using the flash to light the subject. If the available light is insufficient then you need to build up more light until the clearest and best photo is taken. This may involve bouncing flash light up off the ceiling or outdoor canopy. You shouldn’t see light in the final picture—you should see the subject. Dropping to one knee and shooting up at your subject yields a heroic image. 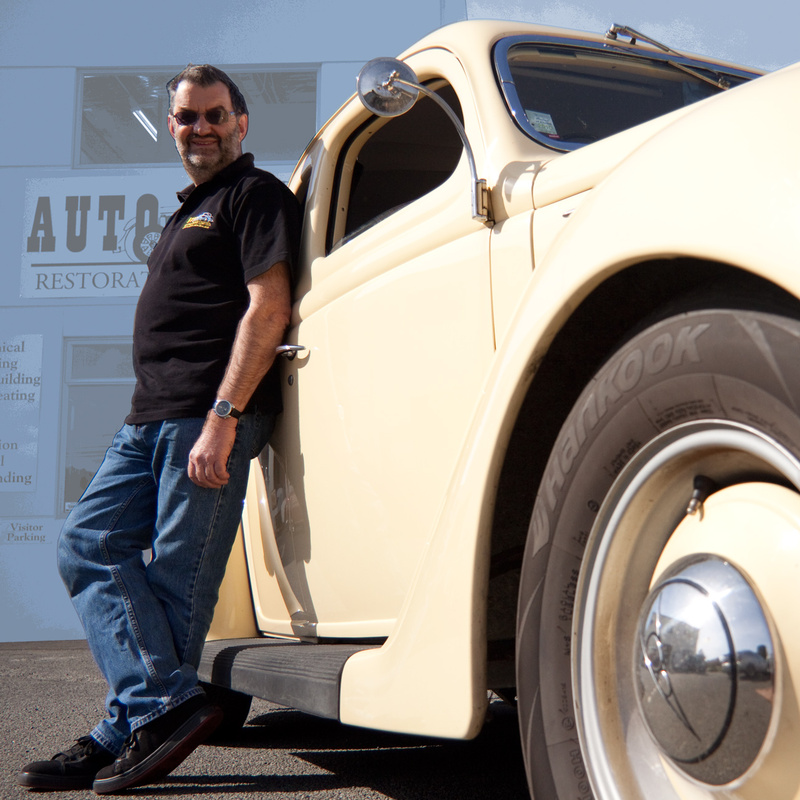 Informal portrait of Allan Wylie, Auto Restorations’ manager leaning against his 1938 Ford roadster. 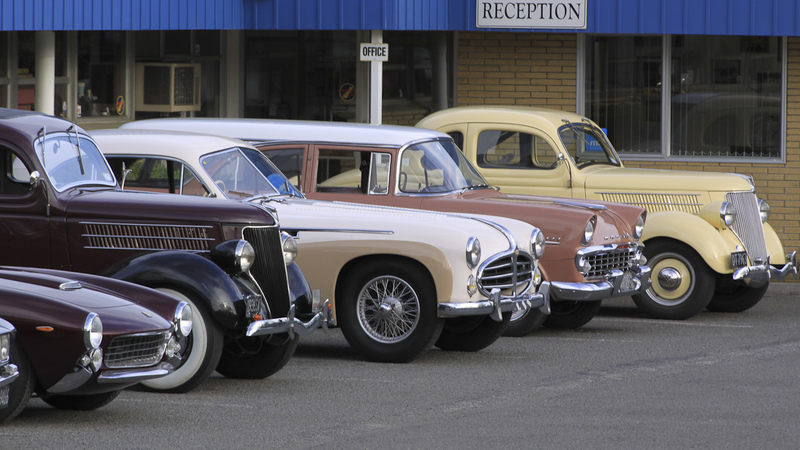 Auto Restorations has a story to tell. This capabilities and profile brochure was designed with people in mind who will have heard about Auto Restorations by other means, such as work of mouth, the core of the brochure design, as with the website redesign is for people to see the sort of things that Auto Restorations do, the sort of company that they are. The idea is to give them the impression that Auto Restorations are people worth their while to deal with. So the main purpose, as with the website is to; showcase their work, give an impression of what the company is like, give the impression they are reliable and work to the highest achievable international standards. This well executed redesign of Christchurch Classic car restorations specialists Auto Restorations’ website is a combined rebrand and website redesign project that has been very well received by the client and their target audience. It has also considerably strengthened Auto Restoration’s online marketing and had a positive impact on their bottom line. This well executed redesign of Christchurch classic car restorations specialists Auto Restorations’ website is a combined rebrand and website redesign project. It was well received by the client and their target audience. It has also considerably strengthened Auto Restoration’s online marketing and had a positive impact on their bottom line. Read the project sketch for more detail on the scope of the project. First a 2010 advertising campaign of half page colour ads for Auto Restorations’ services in a glossy Trans-Tasman Classic Car magazine. The theme is to dedicate a series of ads to celebrate their 16 international award winning restorations, a little known fact and a newsworthy story with which to get the attention of their audience.